The Aliso Canyon gas leak was plugged three years ago, but Porter Ranch residents and L.A. County health officials are still arguing with the gas field owner over what, exactly, sprayed out of a ruptured well and landed on neighborhood homes in late 2015. At the time, Public Health Department and SoCal Gas officials attempted to calm residents, telling them that the natural gas was evaporating skyward and that the chemical, mercaptans, which gives gas its distinctive smell, was an irritant, but not a direct health risk. Despite that, lots of people reported symptoms during the blowout, like headaches, bloody noses and respiratory issues. The Department of Public Health eventually ordered SoCal Gas to pay the cost of relocating people who wanted to be away from the gas and rotten-egg smell as a precaution. But about a month after the leak began, people started noticing strange oily black spots on their homes, cars and patio furniture. They were told by SoCal Gas that the drops could be many things, possibly drilling muds used to force the well shut or some form of hydrocarbon. But they were not given a definitive answer. Last October, Issam Najm, who heads the Porter Ranch Neighborhood Council, was looking over SoCal Gas' application for a permit from the South Coast Air Quality Management District when he noticed something odd. The application said that the company had a tank to store crude oil on the gas field site. Najm then discovered that the company routinely strips crude oil from the natural gas before they put it in the pipelines for delivery to L.A.neighborhoods. "So when the gas was blowing out of the well uncontrollably, there was crude oil in it and they absolutely knew it because it is part of their standard practice to remove that crude oil," Najm said. Najm stayed in Porter Ranch all four months of the gas leak, and his daughters and wife were there for the first month of the blowout before relocating. The L.A. County Department of Public Health found out about the crude oil the same way Njam did— from the air quality permit. In March the department sent a strongly-worded letter demanding more information. The Public Health department's director of toxicology, Dr. Cyrus Rangan, said he is frustrated that SoCal Gas did not explicitly tell the Department that it routinely stripped crude oil from the natural gas when it was taken out of storage. "They have a tank up there that we could have easily gone and sampled, where we have seen exactly the contents of the crude oil. And they never told us that they had that," Rangan said. "They did not tell us information that was vitally important at the time the leak was happening and they're still not giving us the information that we have repeatedly asked them for." 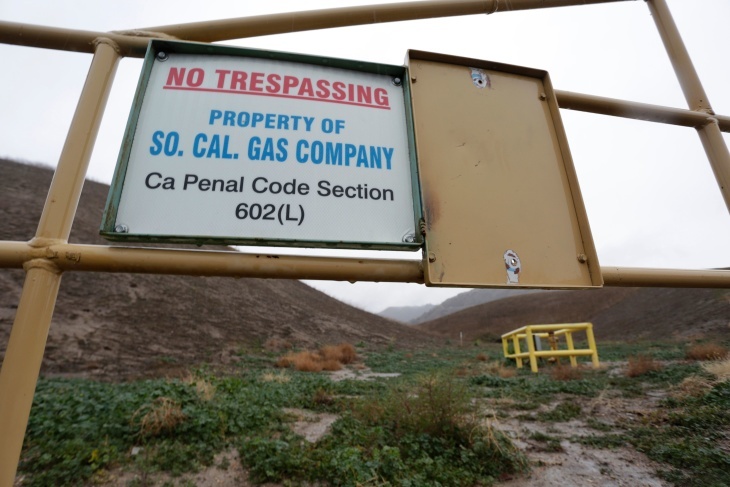 If the letter prods SoCal Gas to release the data, the department aims to include it in a $26 million study of the long-term health effects of the blowout on nearby residents. "NOT A SECRET TO ANYONE"
SoCal Gas says it absolutely did tell the press and public that oil that was naturally occurring in the underground storage field. "The fact that, for decades, there has been oil production at Aliso Canyon and that oil is produced there is not a secret to anyone, including members of the Department of Public Health who operated alongside SoCal Gas at the unified command at Aliso Canyon for weeks," company spokesman Chris Gilbride wrote in an email. "Moreover, after oil spots were discovered in various locations in Porter Ranch three years ago, the residue was sampled and analyzed by both a toxicologist and a medical expert. The independent review showed that the residue did not pose a health risk. Nevertheless, SoCal Gas provided cost-free indoor and outdoor assessments and cleaned hundreds of homes, cars and public parks in response to concerns expressed by the community," Gilbride wrote. The company sent this letter to the Department of Public Health. Najm and the Porter Ranch Neighborhood Council, which is part of L.A. city government, also wrote to the state Public Utilities Commission about their concerns over the crude oil. Commission President Michael Picker replied, expressing amazement that people who live next to oil and gas operations don't know what they do. "I'm always surprised that the community does not still does not know that they live in the midst of an active oil and gas extraction field, not just a storage field," Picker wrote. "I'm also always surprised that they didn't pay attention to my warnings in early community meetings that the CPUC has no authority over those activities." Commissioner Liane Randolph wrote a more temperate reply.